To improve transportation for the FIFA World Cup, the Refice region undertook one of the biggest infrastructural projects in its recent history. 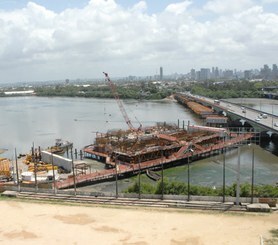 The most important component of the development plan was the enlargement of the Paulo Guerra Bridge, a project in which ULMA played an integral role. 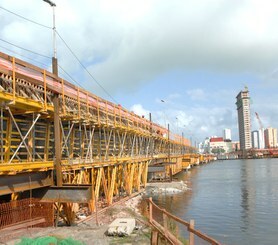 This is the first cable-stayed bridge in Recife, and it was built in such a way as to allow traffic to continue unheeded throughout the entire construction process. With a total length of 560 m and a height of 12 m, the cable-stayed section stretches 97 m long and is supported by fourteen steel cables, seven on each side. 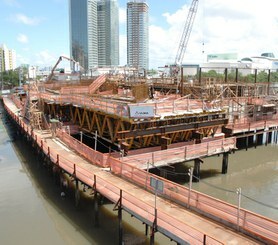 MK trusses were used as shoring for the deck structure of the bridge expansion. A modular assembly of walers, the MK system adapted perfectly to the requirements of the project, supporting varied sections extending up to 23.7 m in length. Thanks to its high load-bearing capacity the MK system was capable of supporting spans of up to 47 m. For sections with lesser strength requirements or shorter distances between supports, BRIO falsework was used in combination with ALUPROP props. The deck, with a section varying between 7.80 m and 15.70 m, required formwork capable of withstanding considerable pouring pressure. ENKOFORM was used as both the horizontal and vertical formwork, chosen for its adaptability to any geometry. The adjustable components of this system create extremely rigid assemblies that are easy to both adjust and transport. 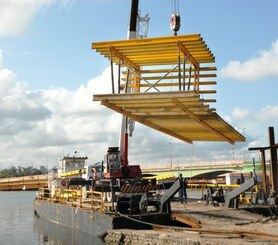 The lightweight MK components facilitated manual assembly of both the shoring and formwork structures. The aid of cranes was necessary only to lift assemblies after pre-building on the ground, a factor that greatly reduced costs for the project. In addition to the 1,500 t of material in use at the peak of the project, ULMA offered detailed technical support based on its wide engineering experience and specialised expertise. Versatile truss system for the construction of large concrete spans between supports. Mainly oriented towards non-residential and civil engineering constructions. It features great flexibility and numerous configuration possibilities.